Finally, we have reached to the third and final part of the series How to keep your car cooling system in prefect shape! For those of you who missed part 1 and part 2 of this series, please read them before you continue to read this part. I hope you enjoyed these posts and found the information I presented here useful. This final post is about changing the coolant in your BMW. The first and second parts concentrated on information about BMW cars cooling system and how to detect any problems inside it. Finally, let me thank the original writer Wayne R. Dempsey for the great write-up he made. Disclaimer: Use this info at your own risk!! I’m not responsible if this didn’t work for you. Okay, so I’ve convinced you that your coolant needs changing. The good news is that it’s relatively easy on the BMW 3-Series. Begin by getting a large drip pan to place underneath your car. My favorite choice is kitty litter boxes, as they are large, are made of plastic, and will hold a lot of coolant. The BMW 3-Series six cylinder engines will hold just shy of 3 gallons (10.5 liters), so make sure that whatever container you use is capable of holding all of that coolant. With your BMW cold, elevate it on jack stands. Place the heater control knobs all the way on hot, turn the ignition to the on position, and turn on the passenger compartment fans to their lowest setting. Do not start the car. By turning the heater knobs on, you are opening the valves to the heater core, which will allow you to drain the coolant located in the core. For cars with electronic climate control, make sure the ignition is on and the heater is set to maximum heat. On the right side (passenger side for US-cars) of the engine, just under the manifold, you will see the drain plug for the coolant. This is a photo of exactly where this plug is located. Place your collection container underneath the plug, as shown below . Remove the plug and let the coolant empty out into the catch pan. BEWARE: I have found it nearly impossible to empty the coolant without having it spill on myself. Don’t wear any decent clothes, and make sure that you are wearing safety glasses when working underneath the car. The coolant will empty out much like water comes out of a shower – it will spray all over, and will be difficult to catch 100% into your pan. Have plenty of paper towels on hand to clean up the spilled coolant. When all of the coolant has been released from the engine block, replace the plug (use a new sealing aluminum ring) and tighten it to 25 Nm (18 ft-lb). Now, move onto the radiator. There should be a plastic drain plug at the bottom of the radiator, as shown below. When all of the coolant is emptied out of the radiator, replace the plug. Tighten to 2-3 Nm (18-27 in-lb). 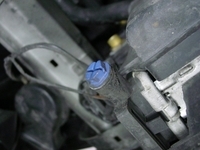 Note this torque is very, very small – don’t over tighten the plug as you may damage either the plug or the radiator. 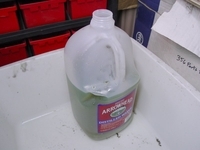 With all of the coolant removed from the system, use a funnel and place it into plastic containers. One gallon spring water or milk containers make excellent storage containers for used coolant. Don’t pour the coolant down the drain, instead take it to a recycling station. 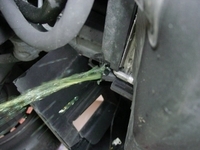 A note about coolant – it is highly toxic and dangerous to pets and small children. Used coolant should be packaged up right away. Less-than-intelligent animals seem to like the smell and taste of coolant, and will be attracted to it. Package it up and seal it off, otherwise you may find kitty dead in the garage one day – no joking. Rinse and dilute any contaminated areas with water. 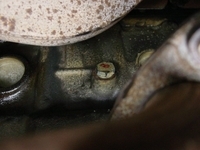 Remove the small plastic bleed screw to the right of the radiator cap. On M3 engines, this screw is located on the thermostat housing. Using a large funnel in the expansion tank, slowly fill the car with new coolant. Use a 50/50 mixture of antifreeze and distilled water. Do not use tap water or spring water, as these have impurities that will contaminate your system. Distilled or ionized water is 100% H20, and does not contain any minerals, additives, or impurities. Fill the system very slowly, as it will take a bit of time for the coolant to get to all points in the system. On 4-cylinder cars, you will need about 7 quarts (6.5 liters). For the six cylinder cars, you will need 10.6 quarts (10 liters). M3 motors require 11.1 quarts (10.5 liters). This, of course will mean that plenty of coolant will spill all over your radiator, and down onto the ground. Have a catch pan ready to capture this coolant spill. When no more bubbles exit out of the bleed screw, tighten it to 8 Nm (71 in-lb). Now, run the engine until it reaches it’s operating temperature. Turn off the engine and let it cool down. 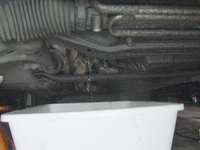 Then, top off the coolant in the expansion tank to the appropriate level, if necessary. I’m sure one question you’re about to ask is “what type of coolant should I use?” BMW has issued a 1991 technical bulletin, 17 01 88(1743), which details problems with what is known as silicate gel precipitation in engines. 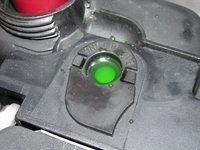 This is the ‘green goo’ (yes, it actually says that in the BMW Tech bulletin – gotta love those German translators) that results as a consequence of an antifreeze over-concentration in the coolant, combined with hard water, and the phosphates commonly used in many antifreezes. BMW factory antifreeze has been formulated to prevent this problem of silicate drop-out without any coolant performance loss. This antifreeze contains no nitrites and no phosphates. The part number for a one gallon container is 88-88-6-900-316, and it costs about $13.00 per gallon. Although I am always eager to find alternatives to BMW factory products, I would stick with the factory coolant for now. Well, there you have it – everything you’ve always wanted to know about BMW cooling systems. Be sure that after a few days of driving, check the coolant level again, and top it off if necessary.